What3Words is a new way to locate an address, measures in 3x3 metre squares. Find out more and grab the app by clicking here. If you're a guest on one of our shows, the image below should help you find us. 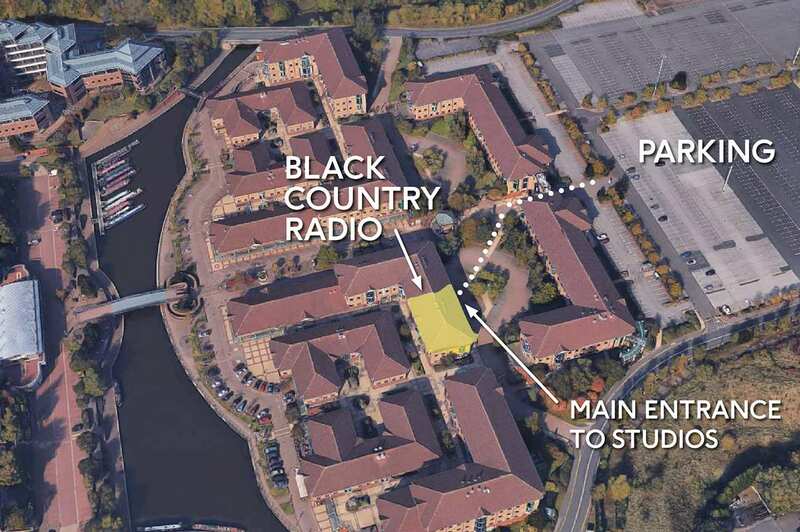 The bottom floor of the building marked in yellow is the location of our studios. The main entrance to our studios is at the top of the building by the car park. Parking for guests is available on the main Waterfront car park (see above). The car park contains 1,500 spaces - including disabled spaces - and access to our studios from there is step free. Please note; this car park is closed by security in the evening, however any cars parked there before that time will still be able to leave the car park through the night. From there, head towards the office complex and through the central gateway. As you pass underneath the arch, bear to the left and follow the path to our studios. Other car parks around the Waterfront complex are actively managed by a third party and have a THREE HOUR LIMIT. Black Country Radio accepts no liability for any fines incurred which should be taken up with the management company directly.